A few years ago we were all feeling hygge (pronounced “hoo-ga”), the Danish term meaning contentment, cosiness and wellbeing. Our living spaces included candles, throws, blankets, chunky rugs and anything else that made us feel warm, cosy and content. Next up was lagom, Swedish for ‘just enough’. This encouraged us to avoid extremes and find the ‘middle way’. Uncluttered rooms, bare walls, storage solutions to hide mess and an all-round minimalist approach was the order of the day. 2019 looks set to be the year of umage. Loosely translated from Danish, umage, (pronouced “oo-may”) means “make a bit more effort”. On first impressions, umage doesn’t seem as appealing as the cosy, contented, lazy days of hygge or the uncluttered, no-nonsense (or much effort) approach of lagom. But maybe there is something in it. Might we have been a bit too lazy (in a non-hygge way) these last few years? Might there be some room or space that is lacking in TLC or could the whole house need a fresh injection of style? Could doing less actually make us less relaxed? That chair you’ve been promising yourself you will upcycle, that cupboard door that won’t shut right, the colour scheme that doesn’t quite fit the season. All these little things can be an unconscious stress in the back of our minds, niggling away. By being more umage, we can be proactively fixing these worries and feeling more calm and satisfied with our surroundings. Use that bare wall space again. Put up framed prints of your favourite artwork, a collection of family photos or framed children’s artwork. Re-arrange unsightly or messy areas. Paint over the stain that’s been bugging you or tidy up the bookshelf into categories. Your mind will feel clearer by applying a little effort to fix these little problems. Scandinavians change textiles and even curtains seasonally. Whilst changing curtains may be a bit excessive, seasonally mixing up textiles such as cushion covers and throws livens and freshens up a room. Store any textiles and soft furnishings you aren’t using while they wait for their time to come around again. This is highly effective, very cheap and very umage. It’s not just us that have to go that extra mile, umage-inspired designers are putting in extra effort too. Designs are cleverly multi functional such as this coffee table from umage.com with leather “hammock” for extra storage. Umage.com sells it’s furniture as flat pack but engineer it so screw holes are hidden from view, giving that extra touch of class. We can’t ignore Ikea when it comes to Scandinavian lifestyle trends. After all the “make a bit more effort” ethos of umage certainly applies to building their flat-pack furniture. 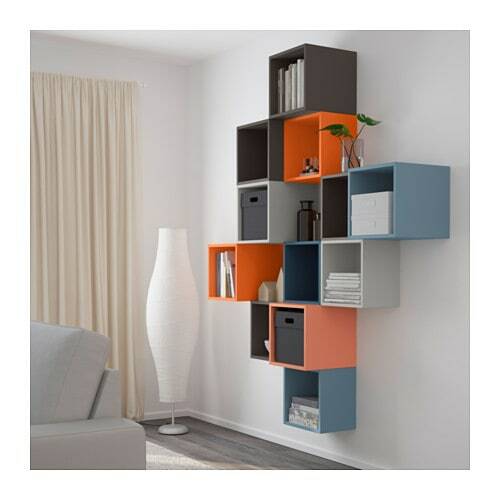 This wall mounted cabinet fills wall space and is multifunctional. Very umage indeed.